Coal mill is grinding mill used for grinding raw coal in coal production line including coal ball mill, coal vertical mill, coal trapezium mill etc. In a word, coal mill means traditional grinding machines improved by us professional in grinding raw coal materials, coarse coal, fine coal etc. Coal mill is mainly used for raw coal material mixing, grinding, and the product fineness even saving force. According to the mill working methods, we can supply wet coal mill and dry coal mill. Coal mill adopted home and aboard milling technology is designed by ZENT widely used in coal mining industry. A complete coal milling line is consist of coal mill, coal crusher, hopper, blower, dustpan elevator, feeding equipment, dust cleaner, piping device, deceleration machines, cyclone collector devices, classifier equipment, etc. 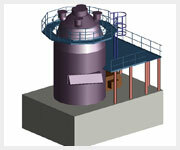 Coal mill is widely grinding equipment and its service life depending on its operation. So, how to rightly operate a coal mill is important in coal processing plants. For example, improper operation of coal mill many cause the explosion of this grinding machine. Now, ZENT has list proper methods of operating the coal mill in order to avoid the disaster. Coal mills are used widely in cement industry, coal processing, petroleum coke grinding, blast-furnace slag industrial, etc. In order to extend the service life of ZENT coal mill, you should take care of the problems as follows. 1. Coal mill operators should master the structure, properties, and specifications, wear parts roles etc. 2. According to the instructions required the operators should mark the ministries lubrication requirements map lubrication, not the use of untreated waste oil, lubrication points to keep clean. 3. Note to check the departments bearing operating temperature does not exceed 60 ℃, and check for loose bolts ministries, with or without abnormal noise is uniform water supply to the mine, a seamless tube plasma phenomena, the electrical current, voltage is normal. Transmission part of the shield is intact. 4. Keep clear of the coal mill working environmental, in addition to the working parts, the remained wear parts should be ready to maintain in right way. ZENT can supply you many models of coal mill such as ball coal mill, Raymond coal mill, vertical coal mill, trapezium coal mill, high pressure coal mill etc. If you want to get coal mill price, coal mill fineness, coal mill specification etc, you can contact us quickly or chat online with our clients in 24-hours service.